Kurran And The Wolfnotes were recording in The Engine Room and The Bridge recording studios in 2010. Here is an interview the band gave during the sessions. Miloco: It’s great to have you here at Miloco. What project are you doing here and when’s it due to be released? K&TW: We are working on our second single release ‘Your Four Limbs’ which will be released through Chess Club records in April 2010. Miloco: You’ve been working in The Engine Room / Bridge. What have you enjoyed about the studio? K&TW: The staff are all very friendly which helps us relax and get on with it! K&TW: The track is one we are all very proud of, I suppose it could be described as alt.folk or there abouts! Probably best to make your own mind up. Miloco: Who was your studio assistant, and how were they? K&TW: Bryan (Wilson). Really helpful and discreet, good fun. Miloco: How did you come about working with Tim Wills on this project and what do you feel he offers that other producers/engineers might not? K&TW: Tim has shown an interest in the band from early on. We are glad we have a chance to finally work on a track with him. Miloco: What’s your favourite record of the last 12 months (give or take)? K&TW: Modest Mouse’s new 7-track mini-album. K&TW: Summer 2010, ’cause its freezing!! Miloco: If you could change one thing to benefit today’s music industry, what would it be? K&TW: We feel pretty strongly about the whole illegal downloading problem. We would like to see the British government take it a lot more seriously. Something needs to be done to protect the great music that the UK has produced and will continue to. 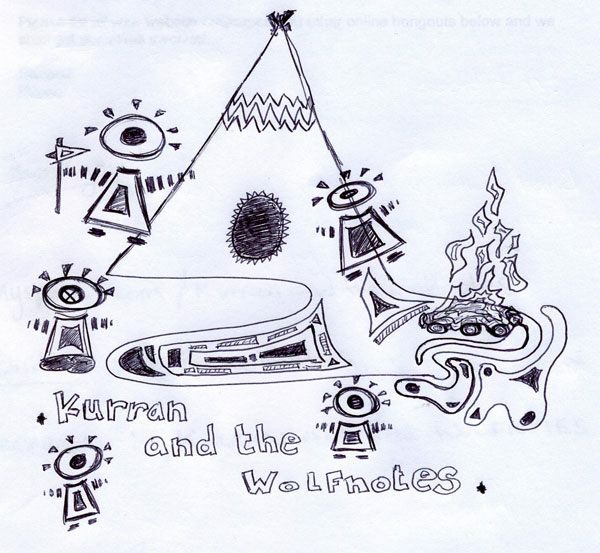 Kurran and the Wolfnotes were speaking to Miloco in January 2010.